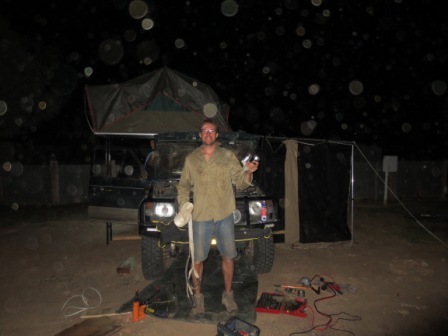 Oodnadatta Track & Lake Eyre – 3 TIMES!! After spending an extra in Wilpena following the previous days walk, we left the Flinders Ranges at 5:30am. We were conscious that we had to push on to make up some time as we are unfortunately on a time schedule for this part of the trip. We must make Perth by the 25th of May to meet Sophie’s parents. It had been raining since late the previous night and although not heavy it was wet enough to make packing up that bit harder as it was still dark. I am pleased to say that we definitely chose the correct tent. The heavy-duty canvass keeping us bone dry throughout the night. We drove out through the Edowie, Byneroo, Brachina and Parachilna Gorges. They were stunning. They were all formed over 550 million years ago and even the untrained eye could see the many contrast of rock and stone formations. The gorges made for an exciting if bumpy road out, the bumps vibrating the UHF antenna until it snapped in two. We rejoined the main road at Parachilna and stopped for a morning coffee and shared a scone, all $14 dollars worth. The smart looking outback pub is located in the middle of a tiny town that feels like the middle of nowhere. The quiet surroundings were a stark contrast to the inside of the pub which also has a very upmarket restaurant that was serving breakfast to a smart Melbournian crowd that had been there the night before for a function, a 50th Birthday I think. The owners of the bar were busy working away serving guests. They had the rugged outback charm but were also dressed in the latest RM Williams gear fresh from the nearest outlet. The place is well worth a visit and I hear the evening food menu is great. We pressed on North to Leigh Creek. This was going to be the last stop in pseudo civilisation before we ‘went remote’. With remoteness comes the increased cost of fuel and the lack of decent fresh food. With it being a Sunday the supermarket was closed the finest food the servo had to offer was meat pies and tins of garden peas. The cost of fuel was steadily heading upwards the nearer we got to the Oodnadatta track. All topped up on pies and gas off we went further north. We later arrived at the start of the Oodnadatta track. The landscape had changed from the greenish rolling hills of the Flinders to the sandy arid flats. The Oodnadatta track proper starts at Marree. 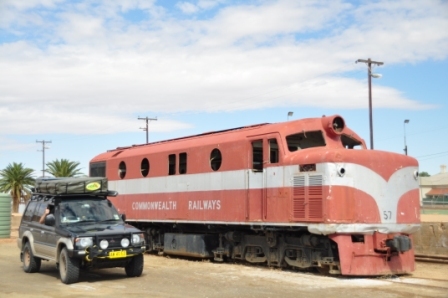 This was a major stop on the old Ghan railway, the small town had a caravan park, a derelict station, a few houses (in which about 60 people live) and one of the biggest pubs I have ever seen! Oh yes there is also a yacht club. The pub still functions as the centre for the town but you can only imagine how busy it was back in the height of the old Ghan Railway. The yacht club was also an interesting place in which we met the commodore of the club. He’s was a very friendly chap who told us all about the MYC. The nearest lake to the club is Lake Eyre, Australia biggest. The problem is that the lake only floods every 20 years and for the rest of the time it’s a dry salt pan. Just as interesting is that the members live Australia wide and they all converge on the area for one regatta a year. This is held at the nearest body of water that can be up to 800klms form the club. Cooling off after a hard day at the wheel. After a look round we picked up some West End Draughts form the pub and headed up the track. About two hours in we passed Lake Eyre. An impressive sight as the might salt pans stretched into the desert. It had already been a long day but we decided to push on to Coward Springs campsite, one of only a few sites on the track. 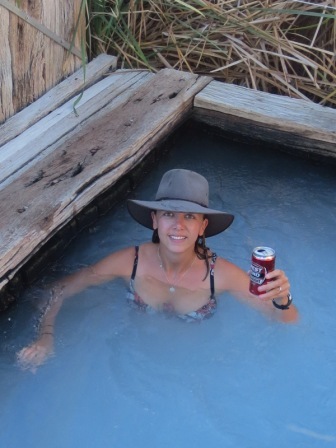 This site also held the promise of being a desert oasis as it has a thermal spring. We eventually arrived at the site in the mid evening. Just enough time for a dip in the springs and put the tent up before dark. West End Draft in had we made for the spa. The spa was about 2m x 2m and made out of old Ghan Railway sleepers. The spring water was pumped in through a massive pump so not quite the natural spring I was expecting but it was refreshing all the same. WE had an early dinner that night, I fiddled with some bits on the car and then we just after the sun went down we went to bed. It was all beginning to feel like a holiday after the manic start to the trip. The next morning I was awake well before sunrise, as I have been for most of the trip. I like am settling into the routine of getting up, making tea and not having to go to work. We packed up in double quick time before the files and the soaring heat arrived as they had been arduous the day before. As the first files showed up and it climbed to 25°C at 8am we jumped into the car. Sophie turned the key; a faint click was heard from the engine and nothing. Sophie tried it again but to the same result. I popped the bonnet and asked her to do it again but to the same result. We had broken down, properly broken down this time in the middle of nowhere and the nearest one-horse-town being 185klms. I went through all the possibilities in my mind. OK that battery is good – check, the car worked last night – check, the power was going to the starter – check (I could hear the solenoid throwing the starter into the flywheel), so it’s the starter motor. The corrugations from the day before must have killed it. This seemed sensible enough answer even though the starter was only 3 month old. It must be a defective one. Luckily enough Sydney City Mitsubishi had provided me with a spare, this was a must have as the car being an automatic can’t be towed easily and can’t be bump started. With this in mind I told Sophie that I will change the starter motor and we will be off in no time. I cracked on jacking the car up and got to work. Soph went to fetch help from the quickly disappearing campers that were all trying to get off before the heat and flies arrived. Two great gents Mike & Steve came over and leant a hand. They agreed with me that it was probably the starter. It took a bit of time and fiddling around but I got the starter changed. By 11:30 we were good to go. The heat was not at about 36°C and the files were unbearable. I was not too bothered by them but the small crowed were covered head to toe. They were very patient waiting for me to finish. I dropped the car off the jack and jumped in to start it. Click – nothing. Bugger! This was not good. We were proper stuck. Mike and I decided that I would have to be towed to the nearest town, Marree, which was 200km away! This meant removing the driveshaft as automatics can’t be towed far. We would also have to stick to 50kmph. We tied Kylie to Mikes truck and set off vary slowly back to Marree. Being towed on a dessert track has its drawbacks. No air con, lots of dust and you get showered with stones form the car in front. Our windscreen copped a hammering and we managed to pick up three large chips and on 25cm crack. That will need replacing at some point! The towing was slow but we eventually arrived back at Marree, a town which consists of a pub, a disused railway station and a Caravan Park. I tormented myself all the way with thoughts about how we were crazy to do this trip in such an old car. I even convinced myself at one point that the engine was ceased and this was the end of the trip. Dark times. We were exhausted the tow had taken 3.5 hours with lots of stops. I thanked mike and his wife Lynne for the tow and offered him a case of beers of his choice but they politely declined. Soph and I got ourselves together had some lunch and I decided that I would have another go at fixing the car. The few ideas I had didn’t work first up. While working away I attracted the attention of Neville the park owner. He was a rugged chap, an ex stockman. He gave me so great tips and showed me how to test the starter by bridging the solenoid and motor connections. He also showed me how to rig up a hot wire to start the car if we had no luck. He was a very resourceful guy as you would have to be in a place like Marree. The only real mechanic in town was on holiday for a month. Fixed at last after 15 hours! Sophie had been feeling a bit helpless all day and decided to help any way she could and spent an hour studying the owner’s manual and the Haynes manual for the car. Hidden in the troubleshooting section she found a section about the wiring of a starter motor. These typically have two positive connections. One from the ignition (which we knew was working) and one from the battery directly. When she read this out loud it sent a flash bulb off in my mind. That hint mixed with the effects of a few cans of West End Draft and I had cracked it! The solenoid was working but the motor wasn’t. I’d found the problem, it was simply a faulty electrical connection that had come lose during all the corrugations, after some further investigations i found the culprit wire underneath the battery terminal connection. So I replaced the original starter motor, cleaned up and tightened all the connections to the battery and bingo – Kylie was working again! 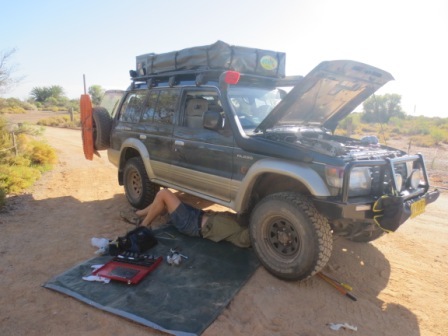 It had only taken 15hours, 200km of being towed across the desert and replacing the starter motor twice to finally realise that all it was, was a lose connection. Lesson learned – go for the easy fixes first!! We celebrated with a few more West End Draughts and then headed to bed – exhausted. The next morning we were not up early. The previous day had taken it out of me. 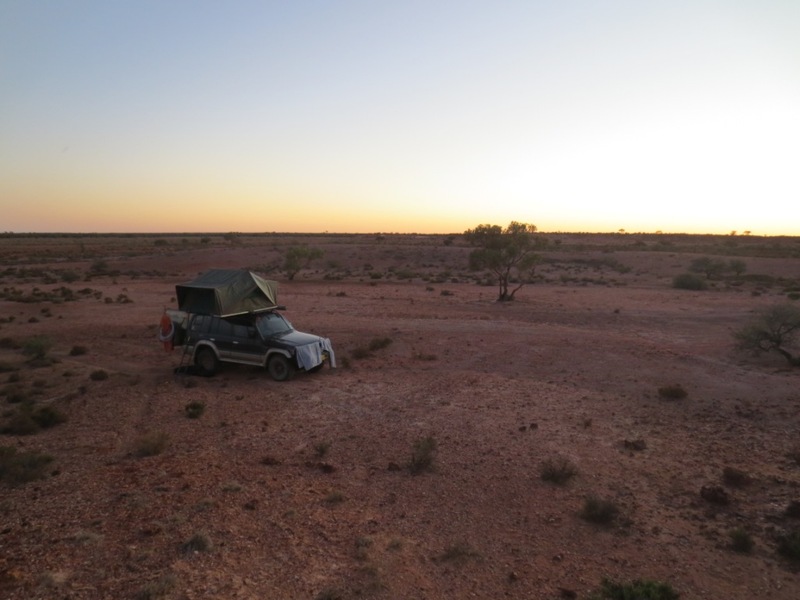 We packed up slowly and headed off up the Oodnadatta track and past Lake Eyre for the third time in three days! The rest of the track went smoothly as we traced the route of the original Ghan Railway line. We didn’t quite make the whole track in one day and just after passing the famous Pink Road House at Oodnadatta we pull Kylie off the track and into the a small valley in the dessert mounds. This was to be our second ‘free’ camp. With camp set up and dinner cooked we relaxed and sat back to take in all the sounds and sights of the desert in a beautiful sunset. It was without a doubt the quietest place I have ever been. Our ears rang it was so quiet. The most peaceful place.